Kayin Barclay wins Illinois Denker again! When Kayin Barclay won the Illinois High School invitational tournament last year, it was another of his lists of accomplishments. The 15-year old scholastic star successfully defended his title by winning this year's tournament on tiebreaks. 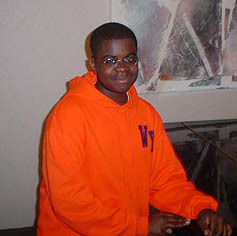 He is currently finishing his sophomore year at Whitney Young High School and has aspirations to attend M.I.T. Barclay, seeded fourth (2006 USCF), battled second-seeded Chris Nienart (2147 USCF) in a tense middlegame and polished him off in an elegant ending. In the last round, Nienart roared back to win his game putting him in a virtual tie with frontrunner Barclay. Unfortunately, Barclay had already clinched the title. In the last round, Barclay would face top-seed Chirukandath Vishnuvardhan (2205 USCF). To show his fighting spirit, Barclay spurned a chance to play for a quiet draw and created fascinating complications after trotting out 1.e4 c5 2.Nh3. Vishnuvardhan, who forfeited in the first round when his driver got lost, defeated Barclay in a tense finale to share a tie for the lead. His win over Barclay would only be good for 3rd on tiebreaks. Barclay will have "home field advantage" as the 2006 Denker tournament will be played in Chicago concurrently with the U.S. Open. Barclay looks to improve on last year's performance. He has his sights on earning the Master's title which will be well within his reach soon. His next major tournament hopes to be the Chicago Open later this month. Editor's Note: Thanks to Bill Brock for contributing to this report.